Learn at your own pace! The Cyber Dog Course is based on the Karen Pryor Academy Beginners Curriculum - a flexible, modular approach. Each week classes are posted to the Cyber Dog calendar. Each class has different theme, targeting a specific set of behaviors. You choose the day, time or theme that fits your schedule and which meets your needs! We offer classes multiple times per week with consideration given to the various time zones of the enrolled students. Watch a video (from our extensive library). Use the accompanying Skill Builder Sheet for your specific training steps. 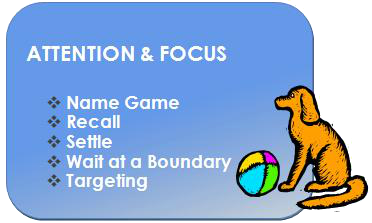 Begin practicing with your dog, choosing 2 or 3 of the behaviors from that theme – this is the fun part! You will be amazed at how quickly your dog learns new things! Make two videos of your training sessions. Review your training videos with a Cyber Dog Teacher and your classmates in an online “classroom”. Your Cyber Dog Teacher will support, encourage, and give you suggestions. Cyber Dog students learn from each other’s video reviews in class. Each time you complete a level of one of the behaviors, you move onto the next level. Each level is carefully crafted to ensure your success. We encourage you to register for two on-line classes per week in order to maximize your individual coaching and your progress towards your goals. Cyber Dog is like having your own personal coach!! Register for our courses no matter where you are!